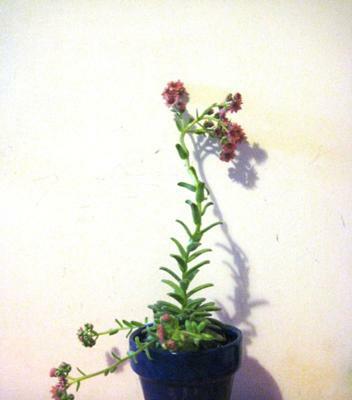 I recently got FOUR succulents from the garden centre and have been trying to identify them, to no avail. Would you please help me? I will upload pictures separately, so you will receive four requests if that is ok. Thank you very much in advance. I hope you can help. 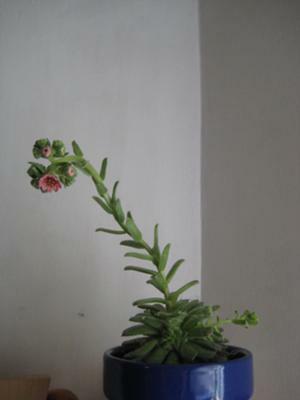 The card that was stuck in the pots said ''Sempervivums and Sedums - Alpine Mix'' and after joining the Yahoo Cactus and Succulents group, I was told they might all be Sempervivums. I am uploading the best pictures I think are good for identification. let me know if you require more information. 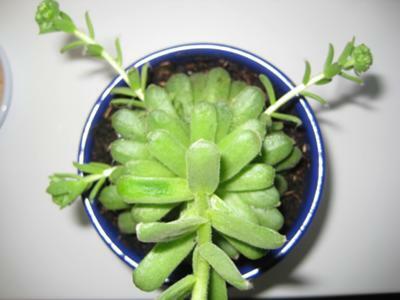 I also hope I help others identify their succulents, as this has truly been mindblowing. Thank you again. That does indeed look like a Sempervivum. It's pretty much impossible to tell you which one as they change so much throughout the year. As it's blooming, I'm sorry to tell you that it's probably done, as these plants are monocarpic, which means 'once flowering' and die after blooming. However, it has produced some chicks which will be the same as the mother. It looks a little stretched, which means that it's not getting enough light. 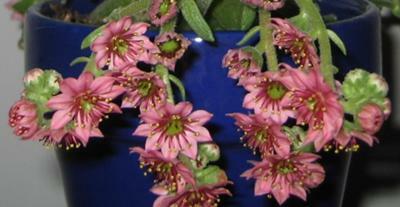 See the page on how to grow Sempervivum for some idea of the perfect conditions for them.